Keenpac has teamed up with Bunzl Catering, to design and develop a brand new concept for a new children’s carrier-style lunchbox for the National Trust. The carrier will replace the current cardboard lunch boxes currently used in their restaurants and cafes. Bunzl Catering are already suppliers to The National Trust, for their core range. However, since the new lunchboxes were bespoke, Keenpac was invited on board to help out with design and development. On receipt of the brief, Keenpac’s packaging designer, Pete Nicholls, set about creating prototype samples. The National Trust were delighted with the concepts and proceeded with the order. 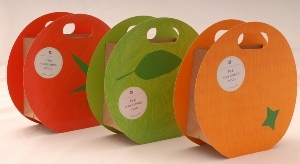 The result – a stunning novelty range of colourful, fruit-themed lunch bags depicting tomatoes, apples and oranges. They’re fun, healthy and sure to be a hit with children and families across the UK!